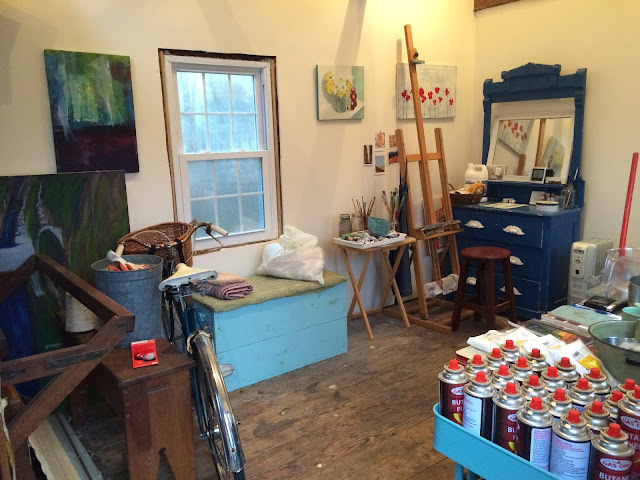 The going ons of one fiber artist and painter living on Peaks Island, Maine who loves cream and sheep. “I find myself inspecting little granules as it were on the bark of trees little shields or apothecia springing from a thallus such is the mood of my mind and I call it studying…"
I’m not sure when I first fell in love with lichens. Not just an appreciation for these tiny leafy growths, but a deep curiosity that has lead me down a path of reverence for what lichens are, how they grow, how they contribute to our planet, and the secrets they hold inside their thin layers. Through this investigative process of finding the pinks, reds and purple that some lichens hold, it has been an adventure like no other. One day in my studio apartment where I lived in Portland's East End, I had a small bag of branches I found with leafy lichens attached. I took the lichen off the branch, popped them into my vintage crock pot, and covered with water. I turned it on high and let it cook away for over two hours. The smell was like the best woodsy smell I remembered from my childhood springs. The color was that of root beer. I strained out the lichens and saved the bath. I slipped in some pre-wetted wool and let it cook away some more. The resulting color was a lovely soft brown, like a nuthatch. And the smell… smelled like a man who spent his days chopping wood in the forest. He probably wore a red and black wool plaid shirt and a soft leather brown belt. A very powerful musk that had me daydreaming — I was single at the time. I dubbed this smell The Woodsy Man Smell. Socks I knitted with that wool dyed lichen, three years ago and through many washes, still have this smell. Since then I’ve been determined to find these colorful pigments, and I started to explore the world of lichens, learning about many species. The color purple has been obtained through dyeing with lichens for thousands of years. Some of these lichens include Ochrolechia, Lasallia, and Umbilicaria dating back to the Bronze and Iron age. Harris Tweeds, a very established and well known Scottish textile company still in business today used (uses still?) Lichens in their famous tweeds. What are lichens? They are a mutualistic symbiosis. The plant body (or thallus) consists of two quite different organisms together in an intimate association; a fungus and a microscopic green plant (an alga). The fungus makes up the bulk of the thallus and the algal cells are buried with in it. Or rather, imagine the fungus saying the to alga, if you provide me with food, I’ll provide you with shelter. Do lichens need a mordant for dyeing? Lichen dyes are substantive, meaning no mordant is needed. All Lichens contain acids that hold precursors of colors. Some lichens have certain acids that give more dramatic colors than others. But all can be used for dyeing and none need a mordant. However, a number of additives can be used to shift the pH to achieve a different color. These include, but aren’t limited to: chalk, vinegar, ammonia, urine, washing soda, iron, onion skins, rhubarb leaves, copper pennies. Experiment and see what happens. When collecting lichens, please be mindful. Lichens take a very long time to grow. Two things to remember; Collect from a spot where there is a plentiful amount. And only collect the lichen when it already separated from its substrate. BWM- simply means “boil water method”. Throw some lichens in a pot and boil away. A method I’ve used many times. Maybe add fiber with the lichens, maybe strain off to use later. The range of colors will be browns, yellows, oranges, and rust. AM- “ammonia method.” This is key for the pinks, reds, purples and blues. There are certain lichens containing these colors that will yield these colors when fermented for three or more months with a 1:2 ammonia and water ratio. POD Through reading, it is my understand that the letters POD stand for “Photo Oxidizing Dyes”. In Casselman’s research, she has traced their use back to the 18th century. But what happens with these POD dyes? What I’ve read in a few places, is to collect a common orange/ yellow lichen such as Xanthoria, found near the sea on rocks, preparing the same way as for AM by making a fermentation vat and let sit for the same length of time. Here’s the fun part: it reacts similarly to indigo in that when you pull the fiber out of the bath, it will be purple or pink. Expose it to sunlight and it will turn blue. And here’s the other similarity to indigo: return it to the bath for another 30 minutes or so, for a deeper pink or purple to return, then expose it to sunlight again and the blue will deepen. Some more detailed info on Xanthoria parietina: The fungus protects the green alga from the harsh UV rays and drought. In return, the alga provides nutrients to the fungus through photosynthesis. I know that lichens are made up of a symbiotic relationship, but is this situation with photosynthesis and UV rays unique to Xanthoria? Possibly, because this is the only lichen species that I know of where dyed colors change with sunlight. Not sure if what you’ve spotted or collected has red, pink, purple, or blue potential? Take a very small piece of the lichen and scrape or tear across the piece to expose the inner white flesh. Carefully pour bleach into the cap on the bottle, then dip the exposed lichen edge in the bleach. If it turns pink or purple or red, it contains the acids to yield these colors. Fill the jar a third full with ammonia on top on the lichens. Close the top and shake. Open back up and fill with 2 parts water, leaving space at the top for aeration. If you tolerate ammonia, use 1 part ammonia and 1 part water, making a 50/50 solution. Close the lid and shake vigorously. Within minutes you’ll see the color shift. Shake the jar every day for at least three months. If you think of it, take the jar outside, remove the top and expose the jar to air. It will help to develop the color. However, if it is Xanthoria, do not expose to sunlight as it may shift the vat color. Put a label on the jar with the date, location collected and the species. Lobaria pulmonaria. Also known as Tree Lungwort, favors oaks but could be found on a beech tree if near water, and growing on the south side of the tree. At one time this lichen was prepared as a jelly and given medicinally to those suffering from pulmonary affections (liver infections). It has been used in England, Scotland and Ireland as a dye to achieve yellows and auburns. The acid found in Lobaria is Lobaric acid. I collected a small amount of this lichen while in Prince Edward Island this past November. I set up the fermentation vat, although I had done my bleach test and no color appeared. I wasn’t convinced, and thought I’d try this anyway. Judging by the results of the pale apricot, I should have stuck with the simple BWM. However, I found the vat exciting and promising. Umbilicaria pustulata also known as rock tripe. Grows on rocks in upland areas in high altitudes. It contains gyrophotic acid. It has been used as a purple and red dye for thousands of years, mainly in the northern hemisphere. I first gathered a small amount from a boulder on Squam Lake last September. where I had been teaching foraging and natural dyeing with the Taproot Gathering. After a lively lichen conversation with Stephanie Pearl McPhee on the first night, she encouraged me to look for Umbilicaria pustulata, calling it black potato chips growing on rocks. I then knew I had also seen it on a trail near Bethel, Maine, one of my favorite spots. When I got home, I prepared the vat, and it’s fermented since September. 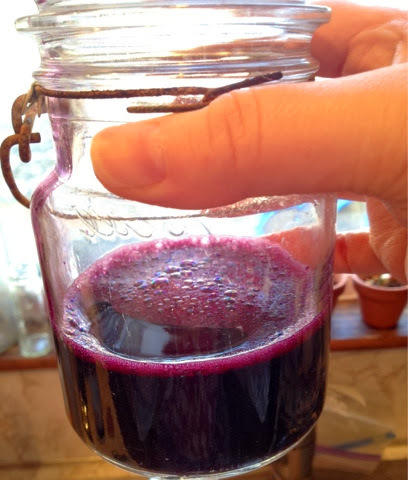 Photo below: preparing the dye bath, I poured off a small amount from the fermentation vat into a clean jar. Xanthoria parietina also known as Golden Shield or common golden lichen. I’ve read in a few places that it’s a weedy lichen as it’s so common. But still, I feel it should be collected with reverence as with all lichens. It contains the acid parietin. I first collected this lichen while in Ireland last spring and summer. My husband and I were on our honeymoon and we travelled to the Giant’s Causeway in Northern Ireland. We wandered off the beaten path to get a closer look at the water and to daydream of Finn McCool outwitting the Scottish giant, Benandonner and meeting up in the waters between Ireland and Scotland. There, I noticed boulders covered in a thick bright orange and yellow lichen. I collected about a tablespoon, sticking the loose yellow flakes in the pocket of my trousers. Several days later at our rented cottage, I tried the ammonia method for the first time. 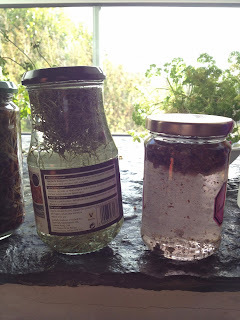 I grabbed an empty jam jar and the ammonia we bought at a garden store in town and prepared my first fermented lichen jar. Within minutes, the liquid inside the jar went from clear to pink, and deepened as the days went by, appearing like red Kool-Aid. As I waited for the color to shift I went outside to look out over the huge expanse that was our neighboring peat bog. I breathed the air and could smell the bog, lichens, and the rich freshness that Irish air is. I stepped back inside to look at my jar and I felt the familiar but rare sensation of sparkly sprinkles dashing across the top of my head. It's a feeling I've been experiencing for years when life lines up perfectly and I feel I'm smack dab in the middle of a magical energy. I’d read that I should open it up every day outside to aerate it so the color would develop. 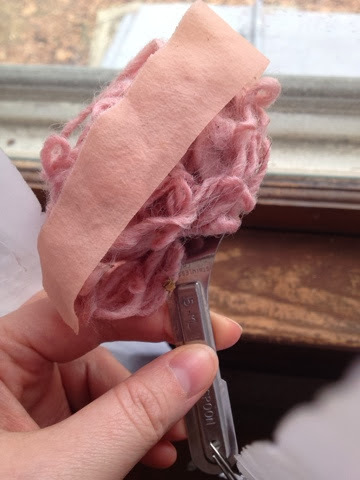 I also stuck a piece of hand-spun wool inside to just sit for a while. 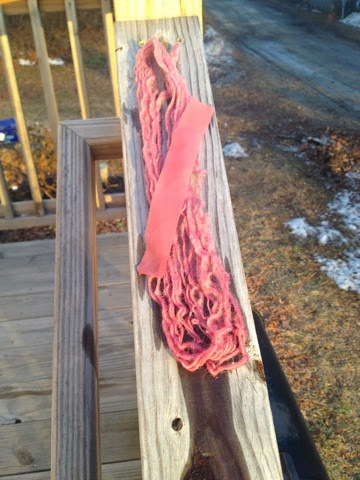 It dyed the wool pink without any heat, but eventually the color in the bath changed to brown. I was disappointed, but knew I couldn't keep the vat forever as we were returning soon to the US. Then we took a short trip to Inis Meáin, the middle of the three Aran islands off western Ireland. We had a glorious time! I found more lichen to collect in an unexpected spot. This time I kept it wrapped in a handkerchief to be prepared when we had reentered our US lives at the end of that month. Once prepared, that lichen fermented the longest. I then noticed we have the same-looking lichen here on Peaks and in Portland. I collected about a teaspoon near the Portland ferry landing, on the Eastern Prom, and also at a cemetery on Peaks, where I had a pleasant conversation with the groundskeeper about lichens. He was delighted to hear that I wanted scrape lichen from the headstones, because every year he, along with many others, uses a certain treatment to clean off the headstones to preserve legibility. Imagine a family member who wanted to locate an ancestor but couldn’t recognize the headstone because it’s covered in moss and lichens. However, on the flip-side of this, Lichenologists have been working to preserve cemeteries where lichens grow so as to keep the headstones from being cleaned as it offers a valuable resource in studying these delicate microsystems. A fellow natural dyer just sent me this link on the subject. Thank you Alissa! By the end of the summer I had prepared about 4 very small glass jars containing all the same lichens from various Maine (and one Ireland) locations. You’ve prepared your vats (fermenting jars) and they’ve been ripening for months and you’re ready for this next step in discovering the world of colors that lichens keep. I strongly suggest you use a very small amount of fiber for the strongest color, an ounce of less of whatever you like: wool, silk, alpaca, etc, to start. This is really important: pour off only about a cup’s worth of the liquid pigment. Then pour that cup into whatever dye vessel you’ll use. 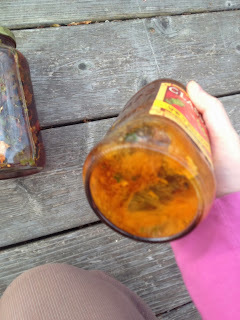 If I’m dyeing a small sample, I create a double-boiler method with a mason jar in a larger pot. The pigments that come from lichens go such a long way — you do not need to dye with your entire fermented jar at once. If you did, it would be very wasteful. In the beginning when you collected your small tablespoons and you prepared your fermented vat, it wasn’t very much, was it? Perhaps you wondered what you could dye with only that amount of liquid? Well, the good news is that with lichen dyes, the pigment stretches wonderfully. Put in your scoured and pre-wetted fiber in the pigment and cover generally with water so that your fiber can swim freely. Heat slowly and watch the temp so that it doesn’t get hotter than 180 degrees Fahrenheit. Heat for 1 to 2 hours, then turn off the heat and let cool slowly. Xanthoria fresh out of the jar, I brought it outside in the sun to let the UV rays (though very weak this time of year) do their magic in turning this pinky purple blue with photo oxidizing. However after almost an hour nothing happened. The light yellow/ apricot is from the Lobaria. 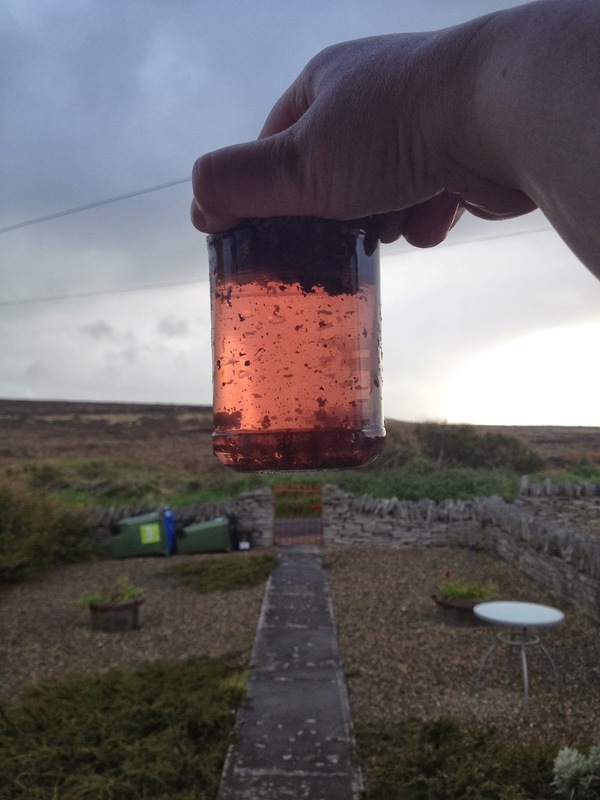 The middle pink purple is Xanthoria after a day in sunlight. The garnet/ wine color is Umbilicaria. Each small skein is wrapped with a strip of silk I also dyed in the jar. The second day I dropped in another sample skein into the Xanthoria and Umbilicaria jars for another go. The top two skeins are from day 1. 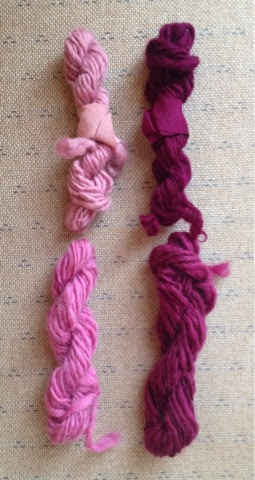 The bottom two skeins are from day 2. Surprised to see the Xanthoria even deeper. Maybe come summer with stronger UV rays, the skeins will shift to blue? I did not wash any of these skeins or even rinse them. Washing with soap can alter and shift colors because of the ph levels in whatever soap used. I had such a fun time with these experiments and will of course be going further. Later on in the year as I travel to other parts of the country, I'll be collecting lichens where ever I go. This has turned out to be one of my favorite parts about traveling to new places. It's also a great way to explore a new place and create memories. Wanting to understand lichen ecology, I'll be attending a seminar later on this summer where I'll be using a microscope, small knife and going on walks. I couldn't imagine a more exciting way to spend a week in Down East Maine in June. 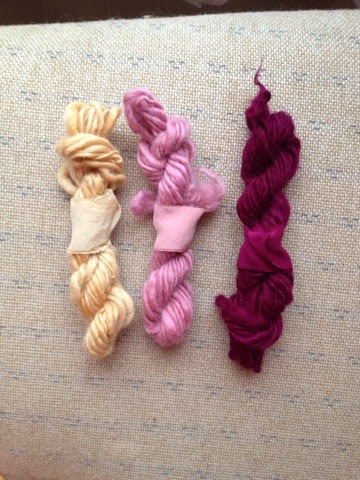 I look forward to using what I learn that week in future foraging and dye classes. The Observer’s Book of Lichens by K.A. Kershaw & K.L. Alvin. England 1963. For me an amusing little book. A bit out-dated as sometimes species are renamed. I found this in my favorite bookstore, Charlie Byrne's in Galway City, Ireland last spring. I’ve been visiting this bookshop on every trip I make to Ireland. My favorite lichen, Xanthoria parietina, is on the cover of this book. And I enjoy reading it with a 70 year old British male voice in my head. Lichens for Vegetable Dyeing by Eileen Bolton, England 1960. A gift from a fellow fiber enthusiast and student I’ve had in a few dye classes. She rescued the book from a rubbish pile. I was delighted to be the new recipient. It has a few beautiful plates and is an easy read. Lichen Dyes: The New Source Book by Karen Diadick Casselman, 1996. This book is what I’ve been using the most, and what I highly recommend —mainly because it’s one of the only ones out there that I know of. In the book, Casselman answers all the questions about lichen collecting, from ethics to colorfastness. Casselman also published a document in regards to dyeing with lichens and mollusks called The Politics of Purple. Kasey, regarding the orange, I just started round three of the madder. Defiantly by next week at the latest:) and thanks for reading. Here's a link to my blog with the photosynthesis I got with my local lichen. It has now settled into a bluish grey color but the color rotation was quite fun to watch! It has faded to a grayish blue but the color rotation was fun to watch. Thanks Deb for your links. Isn't curious that the Xanthoria hasn't shifted? I wonder what is up. How do you store your lichens? Or do you use them all at once? Thank you for your question Heartshome. I store the lichens in whatever way will contain them. Because they are pretty much dried all ready, and depending on what they'll fit into to, I'll put them in a glass jar, a paper bag or a plastic bag. Whatever works for keeping them from flying around. They can be stored this way (i think) for a very long time. Hi Lucina, Thanks for your comment! The only alternative that i could think of that would do the same thing- because it is like ammonia is urine, unfortunately. With the ammonia fermntation method, the ammonia smell does fade slightly over time and does not last on the fiber after dyeing. You'd never know if was used. I'm not sure why ammonia has this effect on lichens. And it does make me want to know if there is a more natural way- even other than urine where the same result can take place. Yes, check out the rest of my blog for links. I try my very best to include as many links that I have and that are relevent. Thanks for reading! Such a great tutorial. Thank you so much! Thanks for this complete article! 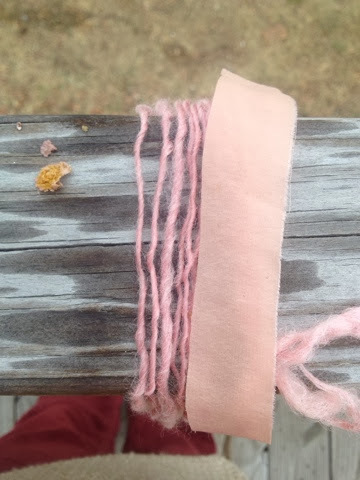 I've been collecting lichens that have fallen from the 100+ year-old trees on our property (apple, cherry, and hawthorn) and now I'm ready to use them for dyeing cotton fabric. Yours is the most informative article/post I've found on the this subject, so thank you for that! I'll keep you posted on my results. HI Susan, Thanks for your comment. It really would work best if you simply looked up the lichen and also typed North America. It will be the same. This post is a few years old now- though my most popular :) It will be the same and less time consuming on my part, especially since I don't have the photos right now:) Lichen hunting in Australia must be WONDERFUL! Great post ! Thanks a lot ! wow! so excited to experiment! I too have been in love with lichen forever and am excited to play with natural dyes! thanks for the helpful information and fostering my curiosity! Hi Rachel... Thank you for your very informative blog post.. As a very novice and a person with lots of alergies I'm liking the idea of using my own urine rathen than amonia. I'm going to experiment some more as I have unlimited supply of licken.Thank you for inspitation. 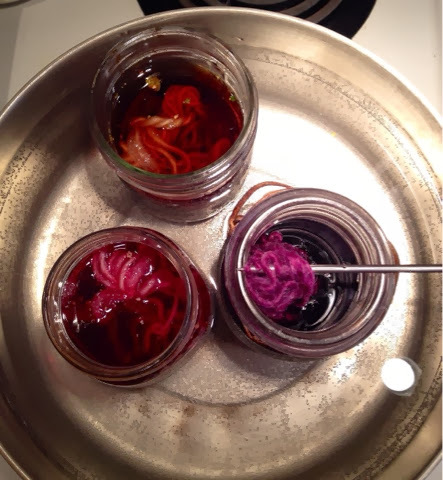 The Unexpected; Dyeing with Beets. Join me along with my fellow instructors at this year's New England Fiber Arts Retreat in Washington, Maine from July 31st- August 6th for some amazing fiber art classes including spinning, natural dyeing, knitting techniques, Scandinavian weaving, fiber prep, and more. Contact me for more info.